a few that should be treasured as the relics of the saints. I've been researching the NRA and the Second Amendment for the past few months. But I got sidetracked when I came across Justice Scalia's majority opinion (5-4) in the landmark Second Amendment case, District of Columbia vs Heller. To better explain the meaning of the words of the Second Amendment, Justice Scalia cited definitions from a contemporary dictionary, the 1783 Fourth Edition of Johnson's Dictionary. Well this gave me an excuse to grab my favorite volume of Johnson's Dictionary down from the shelf and look up the definitions myself. And that's when I got sidetracked. 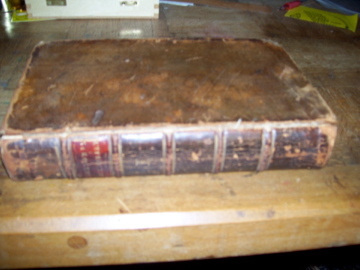 My favorite volume of Johnson's Dictionary is Volume I of a married set of the 1770 Fourth Abridged Edition. My copy of Johnson's Dictionary trumps the copy Justice Scalia referred to because John Dunlap, the printer of the Declaration of Independence, was the bookseller who first sold it. The front cover of this volume is detached, and will remain that way, but I still consider this volume to be one of the treasures in my library. 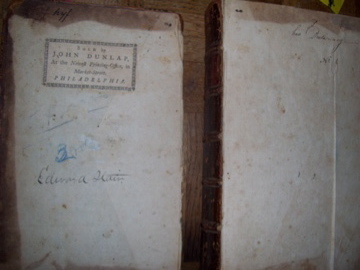 This book was formerly owned by Edward Stair, who signed his John Hancock on the front pastedown, below where an unknown hand overwrote "2 vols." I found no information on Edward Stair, but I'm still researching. I don't think Edward Stair was the original owner of this dictionary. But he may have acquired the book in the late 1700s or early 1800s. The original owner signed his John Hancock in the top right-hand corner of the front free end paper (ffep) and the top right-hand corner of the preface page. These corners, however, and the top right-hand corner of the title page as well, were either torn off, worn off, or cut off. Although the edges of the first few pages in the front and rear of the book are browned, the paper still feels strong, leaving me to wonder if someone wanted the signatures on the pages. If the corner of the ffep was torn off, why did the scoundrel leave the descenders of the first two letters of the first word, possibly the first name of the original owner? 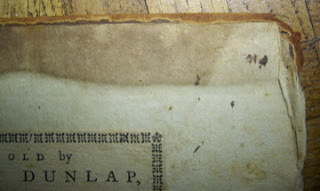 Clearly visible below the descenders, the original owner wrote the words, "his dictionary." And below that, he wrote the numero sign, "Nº 1," but with a dash and a period added below the zero glyph. If there was a signature written on the title page, it was cleanly excised. Clearly visible on the preface page are the descenders of what could be the first two letters of the first name of the original owner. The letters appear to be either "Jo, Yo," or "Go." The letters are definitely not the first letters of the name of one of the former owners, Edward Stair. There may not have been anything written in the top right hand corner of the title page; but the year, 1770, was written in pencil near the bottom of the page by an unknown hand. The only other writing in the book is on the front pastedown. In the top left-hand corner, an unknown hand wrote the letters "hy" and what could be the letter "f." The letters could be a bookseller code. There are impressions in the paper of other letters written in this corner but they are unreadable. In the top right-hand corner of the front pastedown, the letters "ns" are written. Barely visible are impressions on the paper of the letters "Johnso," which preceded the letters "ns." Directly below Dunlap's bookseller ticket and above Edward Stair's signature, an unknown hand wrote "J. D____? 2 vols." Now I have had this particular book since January 2004, and I never got to first base in identifying its original owner. But, I tell you, I had an Epiphany when, while researching the definitions of the words of the Second Amendment, I saw the exaggerated stroke of the descender of the first letter. It reminded me of the way John Hancock signed his name on the Declaration of Independence. John Hancock, the President of the Second Continental Congress, was the founding father who directed John Dunlap to print the broadsides of the Declaration of Independence....Could this be his dictionary? No Way! Well ... highly unlikely. As you will soon see, the "J" the original owner inscribed in his dictionary is not the usual John Hancock "J." And it may not even be a "J" at all. I have been down this road twice before. I have a book I thought belonged to George Meredith because someone wrote "Geo Meredith's copy..." on the ffep. But an expert on George Meredith told me the author would never identify one of his books like that. And then there was a book in which a note on the rear pastedown recorded that General Andrew Jackson bought the book in Washington District on Dec. 24, 1828. But on this very date, Andrew Jackson was 600 miles away burying his wife Rachel at the Hermitage in Nashville. Twice bitten, thrice shy. Yet, I'm a glutton for researching almost anything, even seemingly lost causes. But I wish I had more to work on than two words, the descenders of two letters, and the phrase, "Nº 1." The first things I wanted to research was whether there was any record of John Hancock ever having a copy of Johnson's Dictionary, and if Hancock ever used any phrase when he signed his books. Johnson's Dictionary is not listed in the May 1860 Historical Magazine article of Hancock's library, which was reprinted from Hancock's 1794 probate records. Nor did Jeremy Dibbell list a copy of Johnson's Dictionary when he cataloged John Hancock's library on Library Thing's Legacy Libraries, online catalogs of the libraries of famous readers. One of the books Jeremy did catalog was a 1737 edition of Bailey's Universal Etymological English Dictionary, currently in the Rare Book Collection of Stanford University Libraries. In the Comments Section of the listing, Jeremy added, "Signed 'J. Hancock's book 1754' on the title page, and 'John Hancock' twice on the front pastedown." 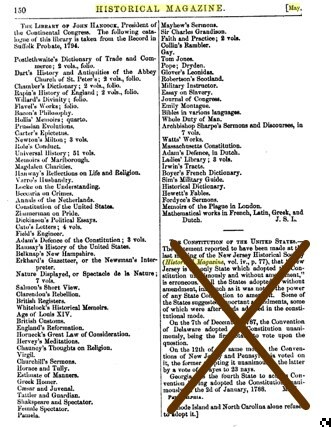 I should note that Bailey's Dictionary is not listed in Hancock's 1794 probate records. And in a 1765 book on sermons by Charles Chauncy, which Jeremy also listed on Library Thing, Hancock inscribed his book, "Ex libris J. Hancock 1765." Kathryn Clever Sisson included a piece about one of John Hancock's books in John Hancock Independent Boy, first published in 1963 as part of the Childhood of Famous American Series and reprinted in 2004 as part of the Young Patriots Series. When John Hancock was ten years old, he reportedly wrote his name and a short verse in a copy of Robinson Crusoe, which his uncle had given him the night before. I could find no record that Hancock had a copy of Robinson Crusoe, nor if he wrote the verse Sisson cited in her book. Is the mention of the book and the verse fact or fiction? Kathryn Clever Sisson's research papers for the book are at the University of Southern Mississippi, just in case I want to research further. And here's something that will probably never get answered: If John Hancock was the owner, why would he write "his book" for his copy of Bailey's Dictionary, and "his dictionary" for his copy of Johnson's Dictionary? Although I had only two words, two letters, and the phrase "Nº 1" to work with, I discovered there was a plethora of John Hancock's handwriting online, particularly in John Hancock's business letterbook in the Hancock Family Papers, Harvard University Library. Although some of the letters in the writing samples are similar to the writing in my book, particularly the "ction," the ascender of the first letter of the first word does not appear to be a "J" written by John Hancock's hand. The ascender portion of the letter looks more like Hancock's "G."
Which begs the question. Hancock was Governor of Massachusetts. Could the first two letters be the first two letters of the word, "Governor?" Would Hancock begin his signature with the word "Governor?" Highly unlikely? And so I ask the booksellers, librarians, and scholars who are familiar with John Hancock and his handwriting: Is this his handwriting? Update: May 26, 2015. A professional autograph dealer in Americana quite familiar with John Hancock's handwriting does not believe the writing in my dictionary was written by John Hancock's hand.